SEOUL, Korea (December 27, 2017) World Taekwondo today published further analysis of the 2017 Muju World Taekwondo Championships as the federation continues to work with independent expert, Nielsen Sports, to analyze the benefits of hosting taekwondo events. 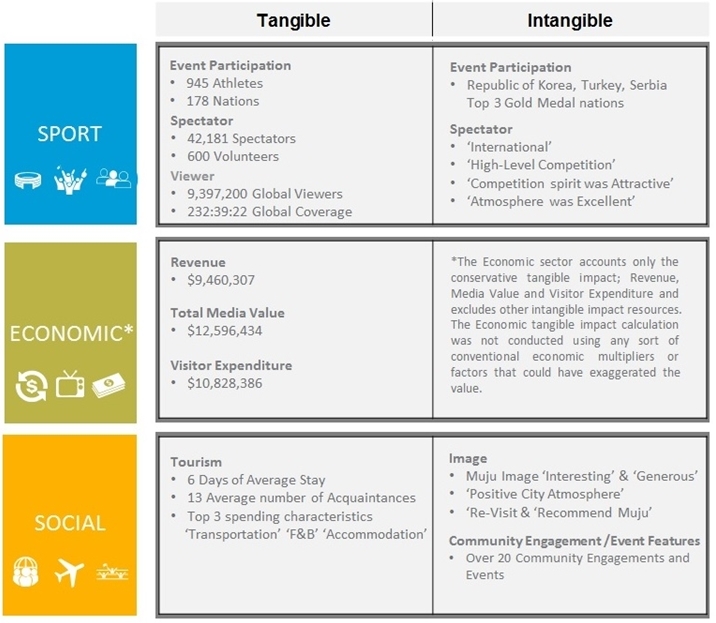 The systematic analysis of the World Championships addresses the tangible and intangible impact of the event from a sport, economic and social perspective. The purpose of the analysis is to assess the benefits of hosting taekwondo events to a city and to a Member National Federation and to determine how these benefits can be maximized to ensure long-term sustainable legacies. The World Championships in Muju, were the largest ever and concluded on 30 June 2017 in Muju, Korea. The host nation, Korea, finished in first place overall, followed by Turkey in second place and Serbia in third place. A total of 945 athletes took part; 570 male athletes and 375 female athletes. More than 42,000 spectators arrived in Muju to attend the event and many spectators described it as an “International and High-Level Competition”. According to Nielsen Sports, 2017 Muju World Taekwondo Championships generated total revenue of $9,460,307 and the TV media value amounted to $8,260.820. There was an estimated 27,207 in-scope visitors from the events and they spent an average of $398 per person across multiple nights. The average number of nights was six nights per person based on the on-site survey conducted during the event. Overall, the event led to a total expenditure by in-scope visitors of $10,829,386. The host city was mostly described as “Interesting” and “Generous” according to the on-site survey. The strongest proposition from the visitors about the host city was the “Positive City Atmosphere”, and the overall assessment was that visitors would like to “Re-visit” and “Recommend Muju to Others”. 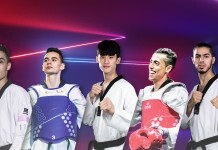 World Taekwondo (WT) President Chungwon Choue said: “World Taekwondo puts a strong emphasis on analyzing our events in order to ensure that we are always working to evolve and improve. By working with independent experts like Nielsen Sports we can objectively examine the impact of hosting taekwondo events and determine how to maximize sustainability and long-lasting legacies”.